By Ursula Vernon: There’s an origin story for fandom that goes like this—“I was a precocious reader and I was tired of the kid books and one day I picked up X and that changed my life and I never looked back.” This isn’t true for everybody, but it’s a common enough origin that it’s nearly a cliché. There I was and I got bit by radioactive speculative fiction. The value of X changes in this story from person to person. Heinlein juveniles and Asimov and Lord of the Rings are popular. But for a good number of us, that book was Watership Down. Richard Adams, the author, passed away peacefully on Christmas Eve. He was 96. I was nine years old and I read this story about rabbits and at the end, the book couldn’t be over. It had mattered too much. I knew, as nine-year-olds do, that things that mattered that much weren’t allowed to just end. There had to be more, and if there wasn’t, I would make there be more. I had no idea what fan-fic was, I had no idea it was even a thing, I just sat in front of the Notepad program on my Amiga 500 and began to savagely hunt and peck because it was important. Richard Adams was 52 when he wrote Watership Down. He’d been telling a story to his daughters in the car, and they asked him to write it down. He would say later that some of the characters in the story, notably Hazel and Bigwig, were based on soldiers he served with in World War II. Adams wrote several other books—Shardik, Maia, and The Plague Dogs, (which even George R.R. 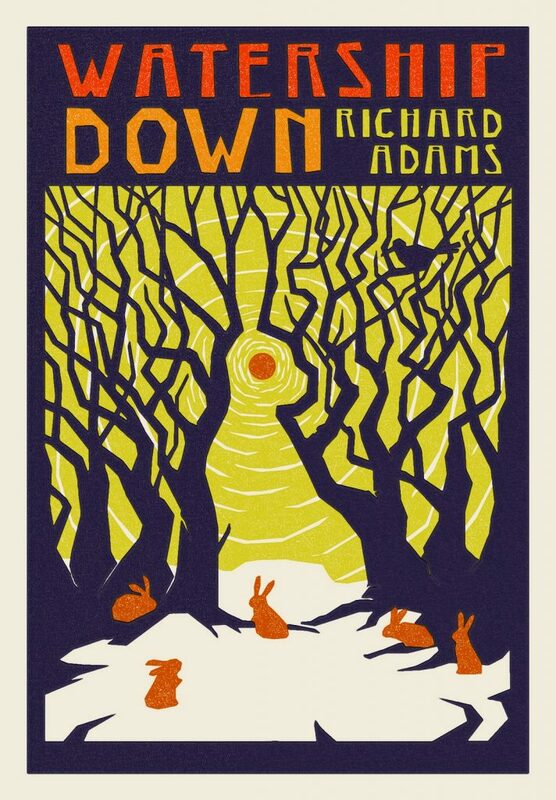 Martin described as a gut punch of a book, and which I could not finish because it was flaying my heart open) but Watership Down is what people remember. It was straightforward, almost brutally simple, and the characters felt like animals, not like little humans in fur coats. It was never cute. Write a book with talking animals in it these days and you can expect to be compared to Richard Adams. (Trust me on this one.) Very very few of us measure up, of course. That’s okay. If we had to meet those standards, we wouldn’t get very far. As a children’s book author, I’ve often tried to explain to assemblies of kids that we didn’t used to have all these books with talking animals—we had Watership Down and we liked it. * (Also, it was uphill in the snow to the library. Both ways. And you had to kill wolves with your library card.) They gaze at me with the polite pity of children who have grown up surrounded by books with talking animals, knowing that I am from some unimaginably ancient era, before the internet or the discovery of fire. I suspect that the vast majority of authors of those books were once like me—nine years old, maybe, with Hazel and Fiver and Bigwig and Blackberry newly etched on their hearts, determined that the story would not end here. I live on Twitter these days, which is either a great personal failing or just the way of the world, and I watched it fill up with remembrances, from authors of bestsellers and authors of small niche works and readers of both, from comic creators and artists and fans. From all of us who, to this day, remember every word of Lapine, who know what El-ahrairah’s name means and why his ears glow like starlight. *Okay, we also had Bambi, and if you read the book by Felix Salten, the death of Bambi’s mother is possibly the least traumatic part of it. I choose not to mention this to third-graders. This entry was posted in In Passing and tagged Richard Adams, Ursula Vernon, Watership Down by Mike Glyer. Bookmark the permalink. Watership Down was an important book to me when I was young, second only to The Lord of the Rings. I can’t honestly say that the idea of writing fanfic of it even occurred to me, though. I should re-read it sometime soon and see how it holds up. It’s been many years. Also I now know that it’s a retelling of the Aeneid. The story did not end there. It continued in Tales from Watership Down. I read Watership Down just a day or two after my grandfather died. I was away on a school trip for the weekend, and didn’t feel like talking to anyone, much less learning how to ski, so I parked myself on a couch and read this book, quite unawares of the bloodiness of rabbits. I was just twelve. I never did re-read it, even though the names remain familiar and the ending still makes me cry. I should probably give it a try. I’m pretty sure I saw the movie of Watership Down before reading the book. I had a paperback with cover art either taken from the movie or very inspired by it, and the last time I saw that paperback it was very dog eared indeed. I read Watership Down to my kids last year. At the end, my 7-year old daughter started crying, not because Hazel had [SPOILER], but because the book was finished. When I was seven, we had the Watership Down audiobook read by Roy Dotrice, with music by George Butterworth performed by the Academy of St. Martin in the Fields. Amazing! Re: Hampus. I bought Tales from Watership Down but didn’t read it to the kids, because it just didn’t have the same magic, at least to me. It just felt like a letdown. Better to go out with El Ahrairah as the primroses are just beginning to bloom. Thanks, Ursula. I can’t count how many times I’ve read Watership Down, but Plague Dogs was the one that shaped my soul. Oh yes. I remember those days. I had Watership Down. I begged and was lead to Tailchaser’s Song. They gave me Redwall, but they weren’t really talking animals so much as people with fur. I scoured the library’s computer (as we had a Supremely Fancy Library System on a Very Small Island, and I was Very Lucky) and eventually scrapped up The Cold Moons, by Aeron Clement (a moon much like Watership Down, but with badgers), and Hunter’s Moon by Garry Kilworth, which was about foxes, and the Ratha series which was about ancient prehistoric cats learning to master fire. and these books I carefully treasured… but never owned. Sometimes I think about finding them to reread, but I’m terrified what my nostalgia glasses might reveal. I sometimes wonder how much it influenced my later assumptions about life that, as a small child, I simply assumed that Hazel was female. Also Merry and Pippin in The Lord of the Rings. The scene where Bigwig tells Woundwort that his chief rabbit told him to defend this run brings tears to my eyes forty years on. I’ve never seen that cover for Watership Down before. I like it much more than the modern version. @Colbywolf – That first paragraph describes my experience, as well. Oh, except, also there was Mrs. Frisby and the Rats of NIMH, which was so much better than the animated movie* that I learned to always check out the book pretty much from that experience alone. I was pressured into watching Watership Down when it was on TV when I was… 11? Something like that. I thought a cartoon about rabbits sounded like just about the not-at-all-what-I-imagined-myself-to-be-est thing in the world, but ended up loving it and hunting down the book very shortly thereafter (I think my friend’s dad may have loaned it to me). Agreed that “Tales…” didn’t have the same magic. I can see how that book could inspire a future writer to take up the pen (or word processor, as the case may be). * The movie was great, but it should have been at least three times as long. I know I loved the movie as a kid (it alternated with the Last Unicorn as the thing I would pick to rent whenever I got paralyzed by choice and fell back on comfort films. Yes, comfort. Bigwig gets out of the snare, and the Watership Down rabbits win in the end. That was my priority as a child). I know I got into the movie because my mom loved the book, and, a couple years after the film became a staple, I’m pretty sure it was the book I was reading in Fiji when I was 9, along with the Incredible Journey (whose animals didn’t talk, but…). Rewatching the movie as an adult, it was too short, too fast, too scant of story and character, though the more stylized sections were still amazing. Rereading the book as an adult (which I last did last year), it still holds up. And its main failing (mostly inactive female roles…) was fixed beautifully in this fic Bright Moon, who Goes Farther Still. A truly amazing novel. It inspired me to spend nine years and six months of my life living with a terrific house rabbit who is now immortalized in tattoo ink, for one thing. Every time I read it I notice something new. I think about it whenever I’m bored by some high stakes fate-of-the-world movie, and remember when I stayed up late turning pages because I wanted to find out if the bunnies made it across the stream safely. @Lenora Rose – I think it was you who linked to that fic ages ago. Parts of it still stick with me in the best way, in a way that goes beyond mere Headcanon Accepted. It’s also one of my examples of why fanfiction is a worthy art form, on the thankfully rare occasion I need to speak to someone who doubts that. I’ve read some Adams (definitely Shardik, and pretty sure on Maia and The Girl In A Swing), but somehow I’ve never gotten around to Watership Down. I have an audiobookversion on my Overdrive wishlist. Adams’ death makes it more likely I’ll read/listen-to WD in the relatively near future, which is a crappy way to get people to read your books. Talking animal books: Our late friend Anne Braude was a big fan of the Duncton Wood books (moles, rather than rabbits) by William Horwood. Haven’t read them myself. The Watership down movie… I think I was 6 or so… It was, as it was for many, quite traumatizing. I may have watched it again a few years ago, but I don’t recall. I think it’s time to, though. But despite my horror, I eagerly read the book when I got my hands on it, though I was in 7th grade, I think. I shoudl read Tales, magic or no. I never have. It’s time to, I think. I have to admit, I’m a bit jealous of those (especially in fanfic) who can do what that author (hossgal) does, and get the voice and feel of the original author down. In my own writing, profic or fanfic, I always feel like it’s a struggle to get any voice but my own (IE, to get the character’s voices down). Pastiche just looks so good and so daunting. Just discovered this rabbity statue.